Over the recent years, a number of scientific studies have shown that selfies aren't just a harmless act of snapping a photo of oneself and sharing it on social media — they can actually be damaging to the individual's mental health as well as negatively impact viewers. Now a new study shows that the negative impact of a selfie can even make its way into your romantic relationships. According to research published in Telematics and Informatics, romantic relationships are negatively affected by selfie-taking for two reasons: because of the jealously provoked from "excessive individual photo sharing or comments about those pictures" and also "the emerging of an online ideal persona in the picture-taker's mind that diverges from real life." These factors ultimately lead an individual's perception of his or her relationship to be less than it actually is. In other words: The false validation that selfies invoke can make people feel as though they are "wanted" and have more options than just their present romantic situations. This, in turn, can make them less satisfied with their partners. In addition, the selfie-taker's significant other is probably going to question the motivation for posting so many of these photos, perhaps wondering if he or she is fishing for a new lover. The survey assessed 305 Chilean adults over a two-year period and, according to PsyPost, determined that "the level of jealousy between romantic partners increased with the amount of selfies that were posted on social-media sites" and "photo-related conflicts as a result of posting selfies negatively affected the quality of the relationship." It also determined that the more selfies somebody posts, the "more likely it is that they are trying to create an idealized persona of themselves for social-media connections to see." Intellectually, these findings make total sense: The more time spent online posting unrealistic images of oneself on social media and playing around in a "fantasy world," the less time an individual is investing in real-life relationships. Other studies conducted in recent years have made some frightening determinations about the dangers of selfies. A 2015 Ohio State University study determined a link between selfies and narcissism as well as psychopathy, while a recent Penn State study found a connection between poor self-esteem and looking at other's selfies. There have also been studies that link snapping selfies to happiness, like one conducted in 2016 by the University of California, Irvine claiming the validation selfie-takers received online from friends and family raised their spirits. The takeaway from this new research should be a reminder that moderation is key when it comes to everything from diet and fitness to selfies and social media. And while excessive selfie-taking may be damaging to yourself and your relationships, there's nothing wrong with turning the camera around every once in a while and sharing a snap of your gorgeous mug. 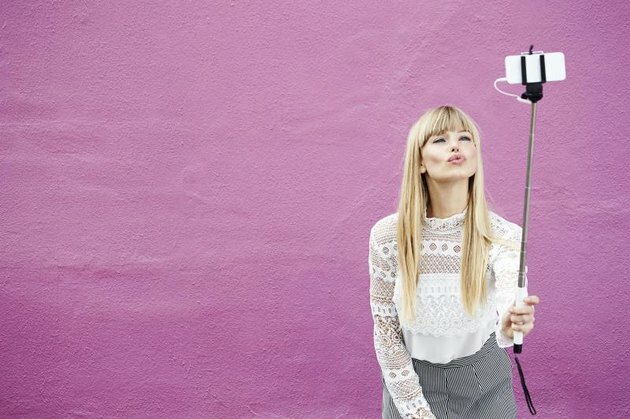 Does selfie-taking negatively impact romantic relationships? How often do you post selfies? Do you agree with the psychology behind this recent selfie study?